There is some debate among fans regarding Sailor Moon S as well and whether or not it stands for Super, since it seems silly to have Super followed by SuperS, but alas, that is irrefutable due to the fact that the title is sung during the eyecatch.2 You can watch and hear it for yourself here! So that brings us back to “R” and where the title comes from! Unfortunately, the eyecatch is of no help, since it simply says “Sailor Moon R!” There are many theories floating around, including that it stands for Romance, suggesting that this is because the series takes on more of a romantic turn in the relationship between Usagi and Mamoru. However, that theory doesn’t really pan out, since the anime had to run with Cardian storyline for three months3 to allow Ms. Takeuchi to get ahead in the manga so they could follow the story.4 This means that they wouldn’t have known yet that the theme of the series was ‘romance’ anyway. Read also: How Did the Youma Used by the Four Kings Differ? Other common theories are Return (since the series came back to the airwaves), Rabbit (after Usagi), Remake (since it’s theorized that the characters were reborn and the year was restarted, explaining no change in age), and Ribbon (… no idea where this came from!). 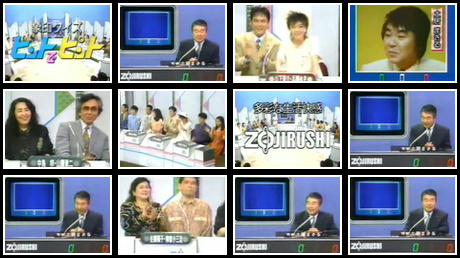 One strong contender for the Return theory is that on the TV program Quiz: Hint de Pint,5 which also aired on TV Asahi (the same station that Sailor Moon aired on) the host, Masaru Doi, read the title of Sailor Moon R as “Sailor Moon Return” in the episode airing July 25, 1993. While we can’t say for sure, one thing that further adds to the mystery is that there’s another series which came out right at around the same time which to which the author also gave its sequel the “R” title after its name: the science fiction Somon Valley series by Katsuhiko Takahashi.6 The Somon Valley series first made its debut in 1985 and the follow-up novel, Somon Valley R7 was released in 1991. Now at first glance this could just be a coincidence, but it’s also worth noting that the producer of the Sailor Moon anime, Iriya Azuma,8 belonged to the science fiction club of Keio University (incidentally, the same university Motoki Furuta and Mamoru in the anime attend) and is apparently quite familiar with science fiction in general. It wouldn’t be too far fetched to say that Mr. Azuma was influenced by this title when name the new Sailor Moon anime series. Regardless of which camp you fall under, it’s an enduring mystery that will keep people guessing for quite awhile longer, I’m sure, or at least until some sort of behind-the-scenes reference material comes out! Hopefully one day we’ll get an straight answer, but for now we’ll just have to enjoy theorizing! Read also: Why Does Rei Throw Her Ofuda at Enemies? ← What Do We Know About Miss Haruna’s Family? Hi! Shouldn’t the names of arcs 3, 4, and 5 of the manga be listed as Infinity (Mugen), Dream (Yume), and Stars (It was only called SAILOR Stars in the anime)? Thanks for the comment, and the suggestion. Could you let me know where you got those names from? I’m following the names offered on the Japanese Wikipedia page. It was also go to follow (in my opinion, at least) that since the first two arcs are named after their respective villians, that the trend would continue. Also, the “Death Busters” name seems to have stuck and is being used for Season III of Sailor Moon Crystal, so I think it can be considered the official name. Still, though, I’d love to see where the listing for those titles came from! They might be the originals before Ms. Takeuchi changed her mind, or something. I believe those were the words that prefaced the individual chapter titles, so it seems logical to take those as the titles for each arc as a whole. If we were naming them all after the villains, then wouldn’t the last one be called something like “Shadow Galactica”? Or are you saying that the villains can also be considered Sailor Stars? On the other hand, the Tokyopop releases named the fourth arc “SuperS” and the fifth arc “StarS”, so there may be precedent for pulling in the anime titles in some way. Hmm, I guess it could be argued in a multitude of ways, particularly going for the “whatever the first title was for a given season is the name used” response. Unfortunately, there don’t seem to be many solid sources on a hard and fast rule to what the names were for each of the arcs of the manga. However, the names I posted in the article are the ones most commonly used by Japanese fans on the internet, and show up pretty universally in all Google searches, so I’d say the list is fairly safe to say as the “de facto” list, as far as Japanese Sailor Moon fans are concerned. Honestly, I’m not a big fan of the idea of “Returns” for one reason alone — “returns” isn’t a word you see often in Japanese written in katakana. I can’t think of many anime, manga, books, or movies that use it in the title, and especially not old series. So of all the options for words Japanese viewers (and kids!) would be aware of, it sounds kind of unlikely. Romantic also seems weird, seeing as there’s nothing specially romantic about the season. o_O Revenge would be weird. The s in Sailor Moon S stand for Super , So does Sailor Moon Super S stand for Sailor Moon Super Super? Naoko, that makes no sense! It’s simply a stylized Supers, as in plural (since the rest of the Sailor Soldiers also become Super). Technically it’s also pronounced as “Supers,” though I still slip up even now and call it “Super S” by mistake. The logo was initially written as “Sailor Moon SS” (still pronounced as “supers”, much like the S in “Sailor Moon S” is pronounced as “super”); there’s at least one CD album that was released with the old version. It was changed after only a few episodes, so the video releases had the new logo from the start. That’s probably why it looks the way it does. A lot of early toys were still marked with the older SS logo (probably because they entered production before the series aired). They… quickly realized that was a bad idea.